You don’t have to have been a fly on the wall to have noticed the gradual increase in fly-tipping in some areas of the UK, as many local councils now admit to this being a real problem. In fact, over 200 council respondents in a recent Freedom of Information Act request confirmed a total of 529,462 cases of fly-tipping in 2014/15. The Telegraph reported that this statistic amounts to a total 16% increase in incidents across the last two years, citing frequent home moves, today’s low-cost consumer goods and the “disposable” nature of flat-pack furniture and white goods as being reasons behind the rise in abandoned household items. Many cash-strapped councils have reduced opening times at dumps and recycling centres for cost-cutting purposes, meaning that these are not always open at the convenience of customers (although many councils have made a real effort to ensure that centres remain open at peak times such as weekends). Costs of council collection – the majority of the UK’s local councils introduced fees for bulky item collection in 2014 and since then many local areas have struggled with increased incidents of fly tipping as households have been unwilling or unable to meet the cost of council collection. Via private companies such as Collect Your Old Bed, which can collect and 100% recycle beds and mattresses for a fraction of the costs of local council collection. 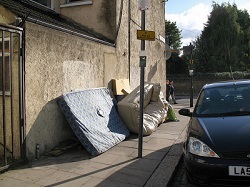 Certainly, there’s now an irony that with some households being unable or unwilling to pay the council fees for disposal of items such as white goods, furniture and mattresses from their homes, choosing to fly-tip them instead puts the cost of the clean-up firmly back on local councils, as predicted by many of the original opponents of the introduction of those bulky waste costs. For example, councils such as Mid Suffolk have seen clean-up costs of £26,187 in 2012/2013 rise steeply to £32,016 in 2014/2015 (East Anglian Times, 2015), whilst costings published by Wiltshire council also make grim reading, with spending for fly-tip clean-up swelling to £278,181 in 2014/15, from £159,298 in 2012/13, an overall increase of almost 75%. Overall, a joint survey of over 140 local authorities identified a total cost in excess of £16 million for cleaning up the streets. But with well over 200 local councils being in the UK, the real cost is estimated to be at least £20 million per year UK-wide. Unfortunately, the cost faced by councils for fly-tipping isn’t just fiscal, there’s also an environmental impact on local neighbourhoods as well as an impact on green targets for recycling within boroughs. Areas of abandoned household items present environmental concerns including being an eye-sore to locals, a public hygiene and safety risk as well as being a magnet for vandalism and anti-social behaviour, as well as presenting specific environmental hazards as households fly-tip items such as fridges, freezers, paints and hazardous materials, many of which require specialist disposal to prevent a significant environmental impact. However, the shocking increase of 16% in fly-tipping in just 2 years is at least having the full effect of shock-tactics in stirring less well organised councils and even their conscientious counterparts into taking more action. Councils such as Wiltshire and Newham have introduced smart technology to help identify and clear fly-tip hot spots before they grow into major costly clean-ups, as well as to encourage residents to name and shame culprits through the use of Smartphone apps, whilst councils including Walsall are looking to improve current services by working with private firms to keep tips and recycling centres open on a seven-day week basis, to make things as convenient as possible for local residents. Finally, residents too can take pro-active approaches by using charitable donation services to recycle unwanted items which are still usable or responsibly disposing of items which are no longer useful, by using alternative low-cost collection services from UK-wide private companies such as Collect Your Old Bed to ensure that old mattresses and beds are 100% recycled into items such as pet bedding and litter, garden mulch and textiles, in an ethical and sustainable way, in a bid to meet recycling targets rather than increase fly-tipping statistics.